Whilst there are many options available, wrought iron gates offer several benefits which make them a great option. Your property can always have bespoke wrought iron gates manufactured and installed without expensive prices or long waiting times. L T Garage Doors manufacture all wrought iron gates ourselves. This allows us to create the intricate and detailed designs you would like and make a smooth installation. Security is one of the biggest priorities in the 21st Century for domestic, commercial and industrial properties. Whilst other gates such as electric and aluminium also offer security, wrought iron is often the best option. 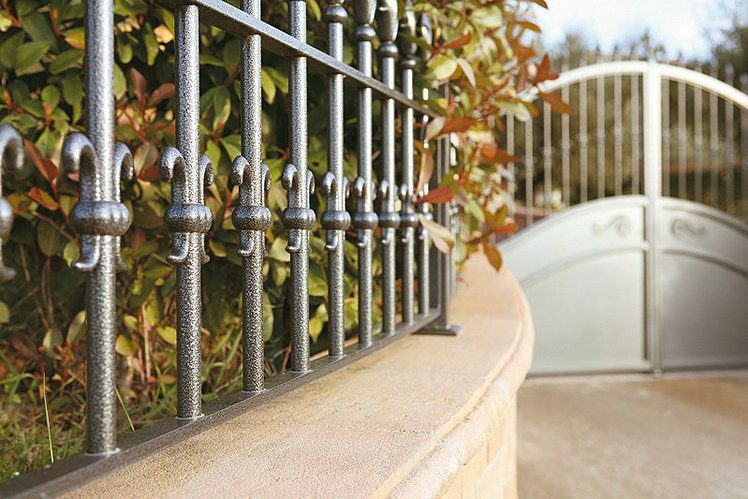 Due to the thickness and sturdiness of wrought iron, there are not many other materials that will match its security. Wrought iron can be used for both gates and fences and with great durability, they should last for decades without needing replacement. Whilst our team are available for repairs whenever necessary, this should not be a common occurrence for property owners. This strength makes the gate hard to break and offers the best possible security, with other security features also available for installation. The style of wrought iron gates also makes it more difficult to climb, preventing break-ins. Due to its style being different to chain links and wood fences, this improves security. Despite its bulk and security, wrought iron gates still offer the classy appearance that most property owners desire. There are not many gates that offer the same quality of wrought iron and with this material, there is also a certain sophistication that is achieved to give your property the best possible appearance. You always want your property to have a high-end look and this begins with your exterior appearance. Your gate is a massive part of this and can be the first look anyone gets at your property. You want to make a good first impression and having high quality, wrought iron gates can often make the difference. In addition to its high-end appearance, wrought iron gates are suitable for all modern and ageing homes. Whether this is a large industrial site or entry to your beautiful front garden, wrought iron gates will always fit in to create a stylish design and match the current look of your property. When having an older property, the vintage wrought iron will never look out of place. Wrought iron gates have been used for over 200 years and the design still remains popular, making it suitable for every property. We have made installations to all homes in the past and can always tailor the design so you have the appearance you want. All gates are manufactured, completely bespoke to your requirements. With many colour schemes also to choose from, you are never limited with the appearance of your gates. There are also many shapes and sizes for every aspect of the gate and therefore you should always be left satisfied. In terms of its easy maintenance, wrought iron gates offer fantastic quality and will very rarely require repairs, replacements or restoration. This makes sure you save costs that would come with other gates, whilst also keeping the design you purchased. As wrought iron gates are durable against most weather conditions, accidents are less likely to occur. For more information regarding wrought iron gates, contact L T Garage Doors Ltd. We can provide a fast response to all designs and offer installation in Cheshire, Staffordshire and all surrounding areas. Call us today on 01782 533 552 or fill in our contact form to make an enquiry. We are happy to work with all clients to find a design you will love.